From the award-winning producers of BONHOEFFER and The POWER of FORGIVENESS comes a fascinating film about the body-mind-spirit connections and health message of the Seventh-day Adventist Church. 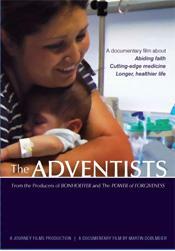 Adventists live on average nearly ten years longer than their neighbors; the film investigates some of the reasons why. A native-born church that arose from the religious fervor of mid-19th century America, Adventists couple a firm belief in the near Second Coming of Christ with a remarkable focus on health, wholeness and well-being. Cutting edge medicine, healthy diet and regular exercise care for the body; education nourishes the mind; and community and fellowship tend the spirit. The film offers several moving, intimate stories of healing. Historical re-enactments show the church’s beginnings and breathtaking medical and surgical techniques show the way forward for this confident, committed faith community. This website is designed to provide further information about Seventh-day Adventists, learn a little more about the body-mind-spirit connections they espouse and gather some healthy eating suggestions. If you are considering a special screening of the film in your community the process is outlined for you and there is contact information to make arrangements. You can also find links to related topics that will help you use the film in a teaching or conversational setting. The ADVENTISTS is written and directed by Martin Doblmeier, produced by Dan Juday and edited by Gayle Añonuevo. It is a presentation of South Carolina ETV. Check your local PBS station for broadcast information. Sign a petition to urge your local PBS member station to broadcast the film.